The Momento software is free to use by downloading a copy from the Momento website. After clicking the download button choose the Save File option and the installer .exe file will download to your computer. When the download is complete, double click on the Installer.exe file to start the installation process. An alert message will automatically appear when you open the software and it detects that a new version is available to download. You choose to Install Now or Install Later. We recommend you update the software immediately, as you can enjoy the benefits of new features, improved functionality and bug fixes straight away. 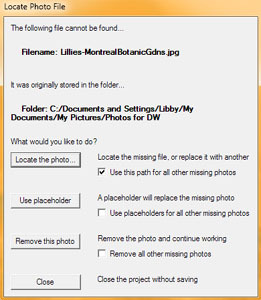 New versions of the Momento software will automatically open your previous project files but an issue may occur if you have moved the storage location of your project or related photo files. If you have moved the location of files, the software will identify this and bring up an alert and a series of windows so that you can point it toward the new file location. 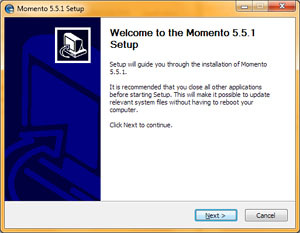 In addition to downloading and installing the Momento software you can go to the Updater Panel to browse and download pre-designed frames, backgrounds, templates, embellishments and Quickbooks. We have organised these in to themed packs we call Packages, each with a descriptive name such as Sloppy Borders, Bright Solid Backgrounds, Templates 1 and Baby Girl. We don’t include all the packages in the software when you download it because this would make the software file a massive file size and therefore take you a longer to download. So we let you choose to download them at your own pace in your own time. Browse the Updater Panel, select your preferred package and click the Install Now button to start the download. When the download is complete the content will appear in the appropriate Contents Panel. 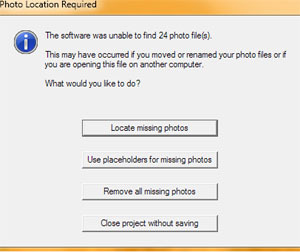 Just as the software detects when photos are missing from your project when you move the location of your files, so too does the software recognise when one of the Packages has been moved or deleted from your computer. Should you open a project file that can't locate images from an embellishment package, you will be prompted with the Missing Collections window to help you identify and locate them. Once you have the software downloaded and installed, you are ready to start a new project.